Fahrfall fans, I present to you the "CoCoFEST! 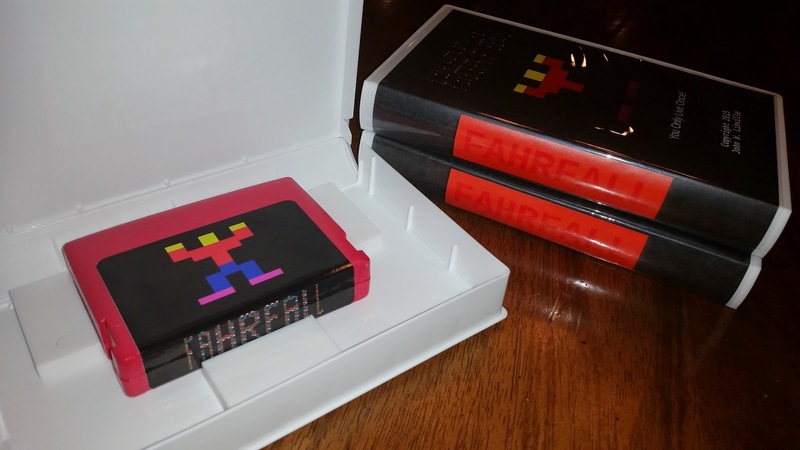 Edition" of Fahrfall -- the first new CoCo game cartridge released in...decades?!?! I also intend to be at VCFSE 3.0 in Atlanta on May 2-3, 2015. I'm not sure I can sell any cartridges there, but at least you should be able to get a "hands on" look at the merchandise. I do intend to put a single Fahrfall package up for sale on eBay, with the auction starting on April 18th and ending on April 25th. That's right, even if you are unable (or unwilling) to come to CoCoFEST!, you still have a chance at getting one of these packages! Watch this space, or setup a search for Fahrfall on eBay. If there are any packages left over after CoCoFEST! and VCFSE then I'll probably make those available on eBay as well. Although the cartridge cases are poured resin, they do require some finish work and a fair amount of labor -- I consider them "hand made". Add to that the labor of assembling PCBs, burning EPROMs, cutting and stuffing printed materials, and applying labels. Economically, this is not the best use of my time! I am making these available out of a love for the CoCo and the people in the community. If there is strong interest in more Fahrfall cartridges then I will probably make more...sometime. I wish I could make a firmer commitment on that, but that is all I can say for now. This is the culmination of a long term project. Fahrfall was the first "serious" game I ever wrote, and it was my first involvement with Retrochallenge. I have learned a lot from this project, including not only the treasured skills of a 6809 assembly language programmer but also the arts and crafts skills associated with casting plastic resin, producing nice boxes, etc. Now, I am giving my fellow fans of the Tandy Color Computer what I hope is only the first of a series of homebrew game cartridges. Some will come from me, and I hope that other CoCo software developers will join me as well in the future! Looks very nice, very nice indeed. It should be a big hit at the meeting, have fun! An auction for one of this is now live on eBay! keep sharing more informative posts.